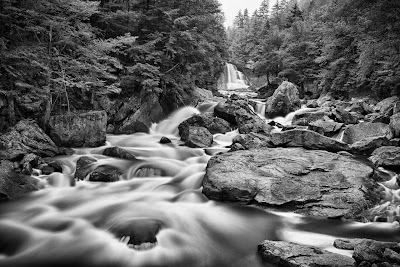 National Geographic published a tribute article to Ansel Adams this month (Oct 2011). 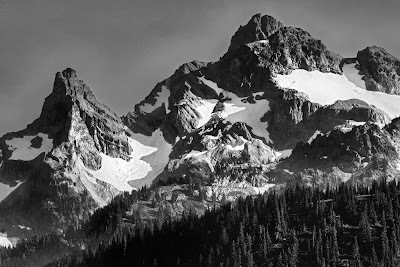 Included in the article were, of course, black and white photos taken in the Ansel Adams Wilderness in California. Although I've never been lucky enough to visit those areas of the country, I was inspired by the article and photographs to go back through some of my shots and do some B&W photo processing of my own. I took the shot above at Blackwater Falls, West Virginia, a few months ago. It was an early morning shoot, driving to and arriving at the park before sunrise. The fog that hovered among the trees was barely discernable down low next to the water and provided a nice backdrop to the scenes I was hoping to shoot. Due to fairly steady and consistent rains, the river at Blackwater was showing its name strongly. The water coming over the falls was a deep brown, almost as if someone was brewing the largest river of tea somewhere upstream. This threw an odd color to the scene as the water just didn't want to come out clean. Therefore I figured some B&W processing would be the way to go. I processed this shot through a series of steps, including Photomatix, Nik's SilverEfex Pro, DFine, Topaz DeNoise, and some good old dodge and burn in Photoshop. Ansel was a master at darkroom processing and it is work like his that I continue to admire and draw inspiration from. 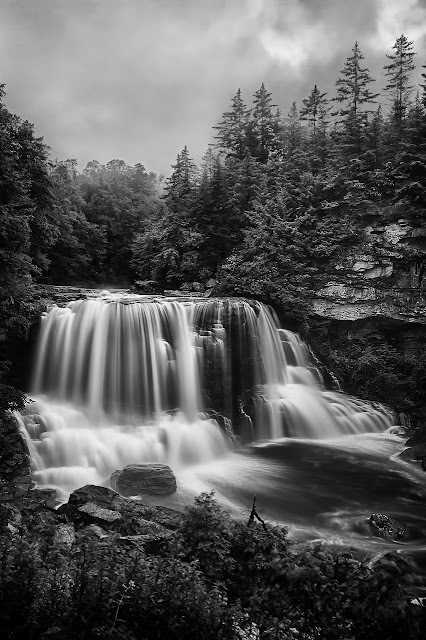 I took this shot at Blackwater Falls as well, about 100 yards down the river from the above shot. In fact you can see the waterfall from the shot at the top in the background of this one. I'd processed this and posted it to Flickr before but since I was just working on the one at the top I felt the two went together. And of course the mountains of Ansel Adam's photographs are a stunning part of his work. I went back to a trip I took to Mt. Rainier back in 2006 in order to find this. I hadn't ever cleaned it up and processed in B&W but I wanted to give it a try. I've learned a lot more about photography during the last 5 years so this shot certainly isn't up to the levels I would hold myself to today, but the subject matched what I wanted to work on. The rocky peaks along the Cascade's and majestic and the peaks at Mt. Rainier are no exception. I processed this with Nik's SilverEfex Pro and basic dodge and burn. This last shot I took on a hike in Shenandoah National Park in Virginia. It is taken on the upper section of White Oak Canyon which has a series of waterfalls of various sizes over the course of almost a mile through the canyon. 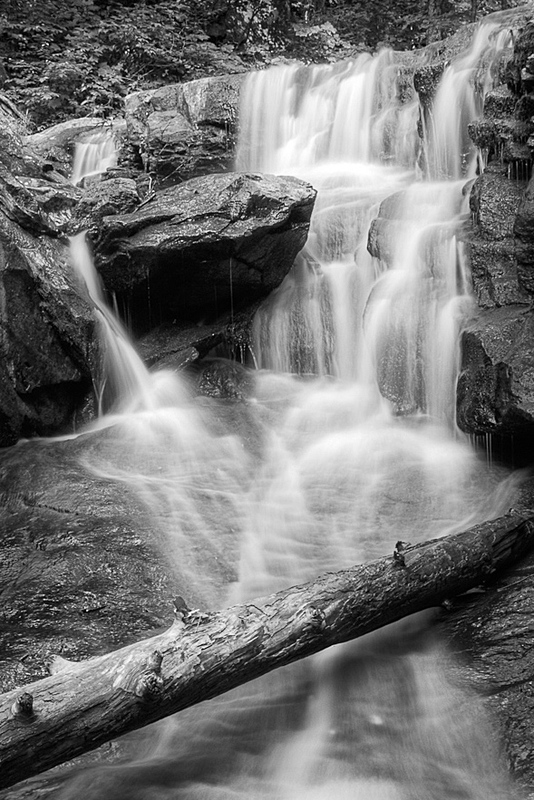 I think black and white processing helps to highlight the structure in long exposure waterfalls images. It is a tight crop of a larger color image. I also processed the shot above in Nik's SilverEfex Pro with some dodging and burning and a little bit of help from the unsharpen filter. Hopefully one day I'll be lucky enough to visit more of the country Ansel so skillfully captured. Until then my own corner of the US will have to do. There are no comments on this post. Be the first one to comment using the form below. Your comment has been added. Comments disabled due to uncontrollable spam. To watermark or not to watermark...Is that the question? Tiny Aperture? Blurry Photo? Blame Physics!